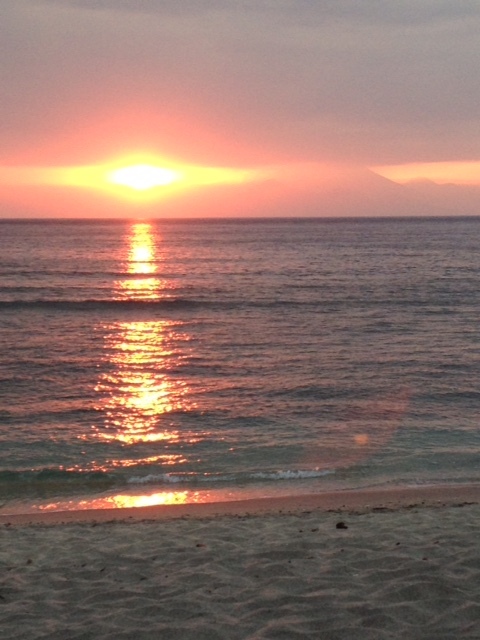 As you will have seen by my previous post Lombok is finally coming into its own and for a true relaxing and laid back holiday then it is the place close to Australia to head to! 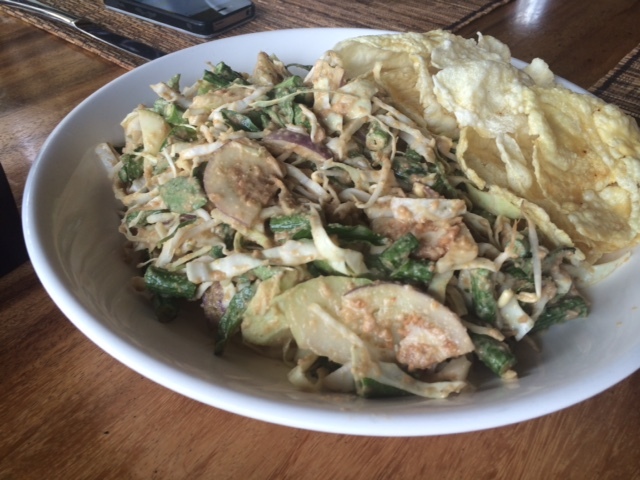 Over the course of our 10 day stay in Lombok we ate in 15 different cafes and restaurants over that time and really enjoyed most of the food at each of these spots around Senggigi. There were some real highs and there were only a couple of low points in all of the places that we dined at. 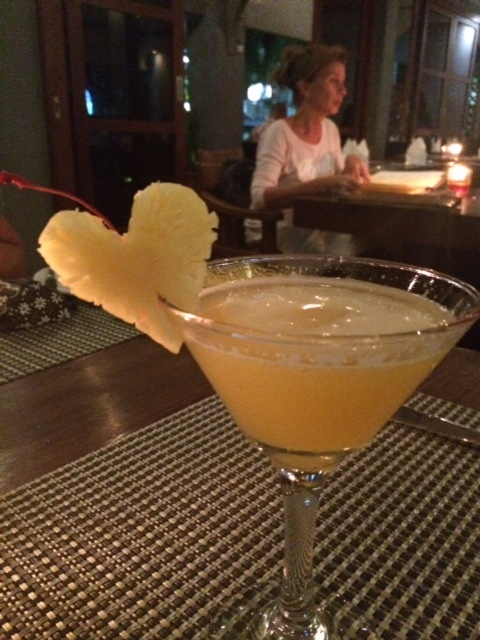 I want to focus here on my favourite spots to dine in when you are in Senggigi. 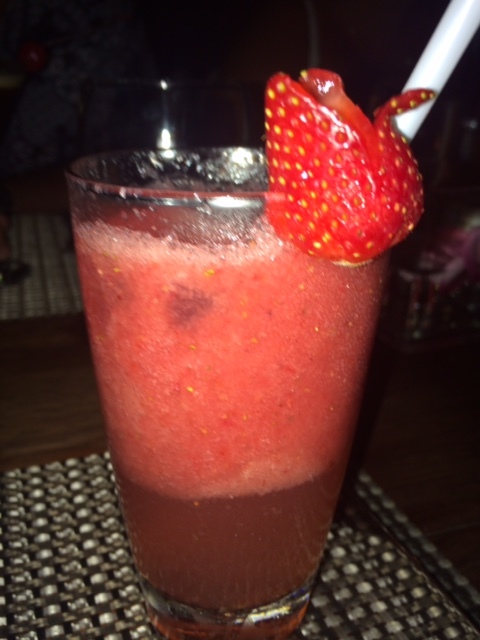 The only thing that I think needs to be worked on across the board is the level of drinks service offered at all of the cafes and restaurants that we ate at. Being offered a drinks menu and ordering at the start of the meal is great but to then not be asked once if we would like another drink and trying to get attention to get one is an issue. I would think that restaurant and café owners would want to get their staff on to this as they are missing out on the extra revenue that comes from having more than one drink at dinner. Number one on my list is The Square. This is ideally located right in the centre of the Senggigi strip and is beautifully appointed and set up so that you feel like you are heading into one of the cool places that Seminyak offers over the water in Bali. The staff are well versed in what is on the menu and offer suggestions when asked about what is fresh and let us know what the specials of the day were. 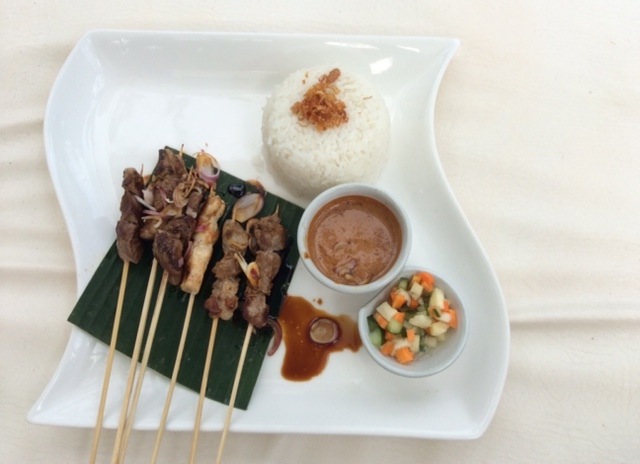 The menu is really intensive and like most places in Lombok offers a range of options in terms of the more traditional Indonesian Fare with a smattering of European food options. Cocktails to start the night at the Square. I really love trying to stay with traditional fare and 95% of the time ate local dishes such as Nasi Goreng, Gado Gado and others. 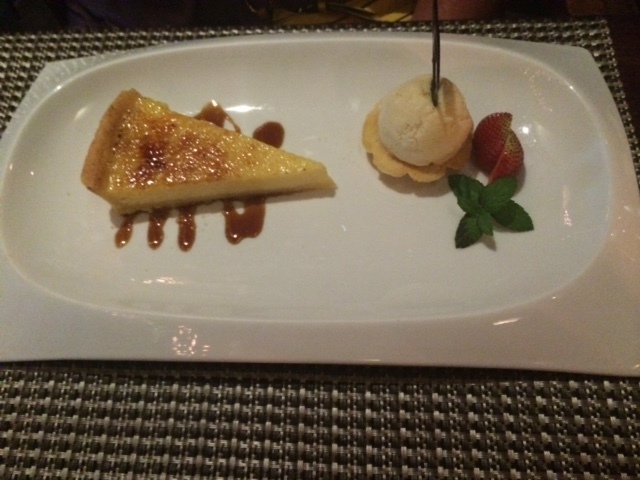 At The Square the food is varied and makes the most of local produce with a European twist. There are a couple of set menus to chose from but both times that we ate there we all chose to select from the menu. 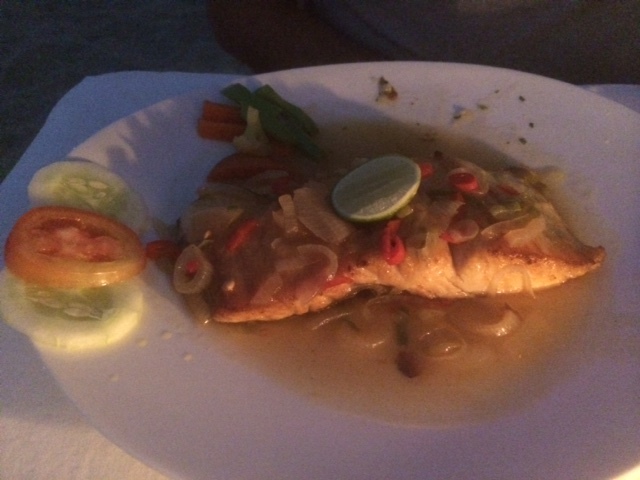 The prices are still really quite reasonable, even for what is considered to be the top restaurant in Senggigi. 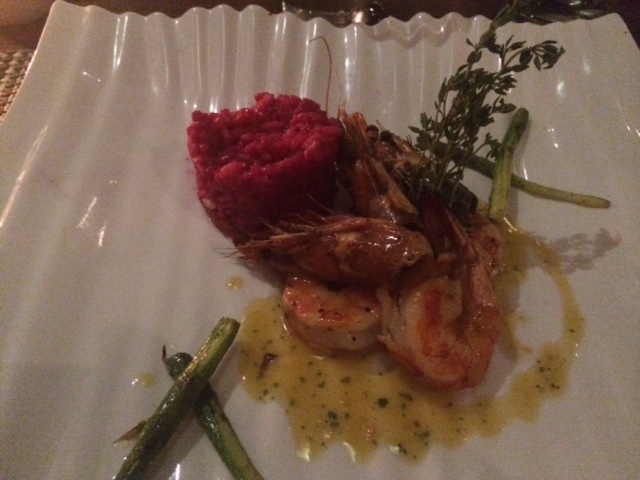 Both times that we went we all chose different things to experience and each dish offered its own complexity and delight in presentation, taste and style. 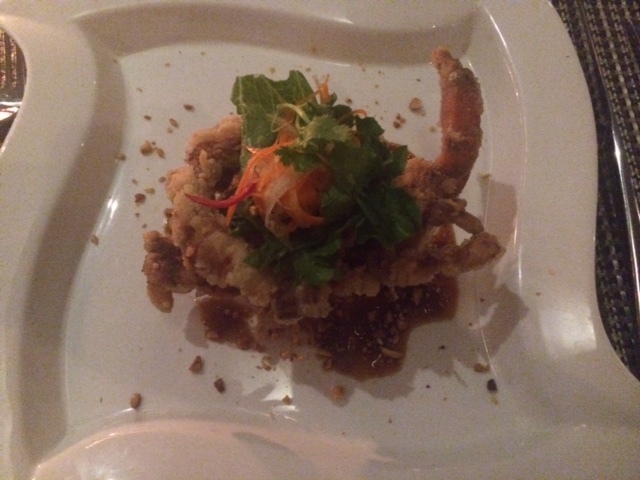 I especially loved the soft shell crab with green papaya salad that was served with a tamarind palm sugar dressing and crushed roasted peanuts. It was delicious, well presented and the mixture of the crab with the papaya was simply delightful. 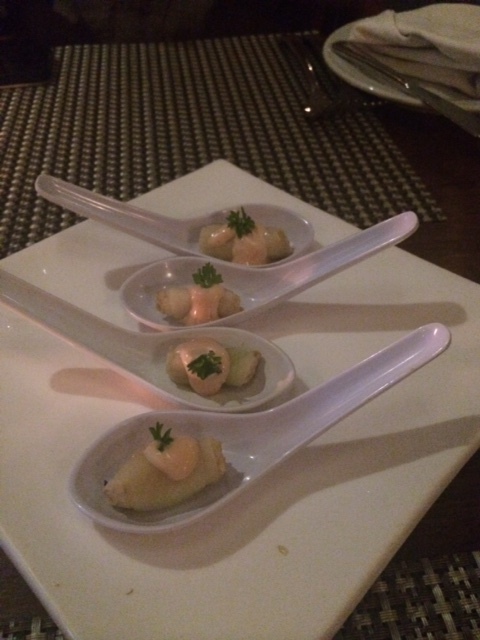 They begin with an amuse bouche from the chef to start the meal which is lovely as well as serving hot freshly baked rolls for the table. Karen, Ken and Trevor had the roasted Duck Salad served with Orange Segments, Asian Vegetables, Sesame Orange Dressing and Toasted Nuts. For main course we had Two Islands Seafood Of Norwegian Salmon Fillet, Mahi-Mahi and King Prawn with herb risotto, tomato provencal, sautéed greens and lime capers butter sauce, the Grilled Angus Beef Striploin, with blue cheese mashed potato, caponata vegetables and port rose merry sauce, the Singang Ikan Sumbawanese Traditional Fish Fillet in turmeric, garlic, candle nut sauce, tamarind infusion served with steamed rice and the Salmon and Scallop Ravooli with capers, tomato and basil cream sauce. 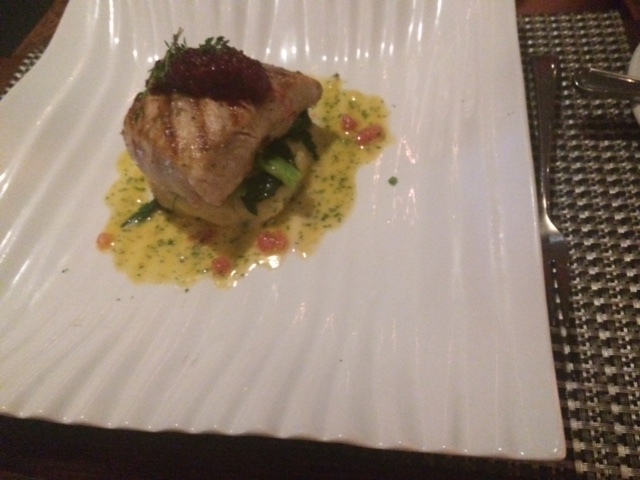 Each main course offered something different and each one was delicious and a real treat. The delightful food at the Square! The dessert was equally as delicious as both the other courses but only Karen and I could fit it in and I had the wonderful Pisang Lose Caramelized Banana Wrapped in a Crepe, served with palm sugar syrup and coconut sorbet but I substituted the coconut sorbet for strawberry sorbet and Karen had the citron tart. 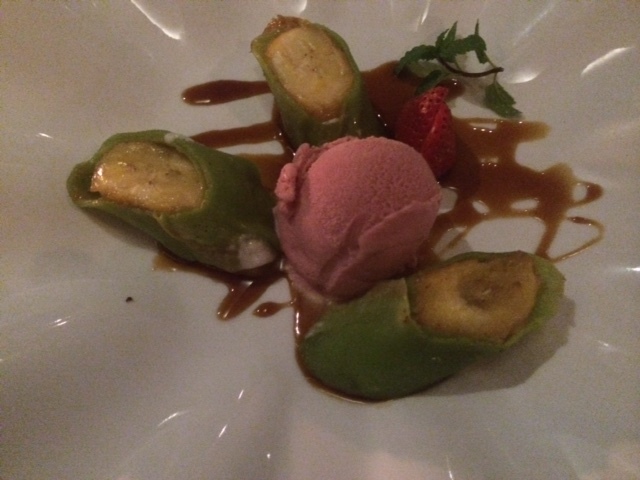 I love the way the Pisang Lose was served…so creative and I thought at first they were serving the banana in its skin but realised it was the crepe wrapped around it…delightful and fresh and the perfect way to end a wonderful meal. The prices were pretty good and for the 4 of us with drinks it was just over $120. My favourite dessert in Lombok the Pisang Lose. The other real stand out in Senggigi is the Asmara (or as Karen would say the Assman) restaurant. This was set in some gorgeous gardens and there were 3 different areas to chose from to sit and enjoy the warmth of the evening. 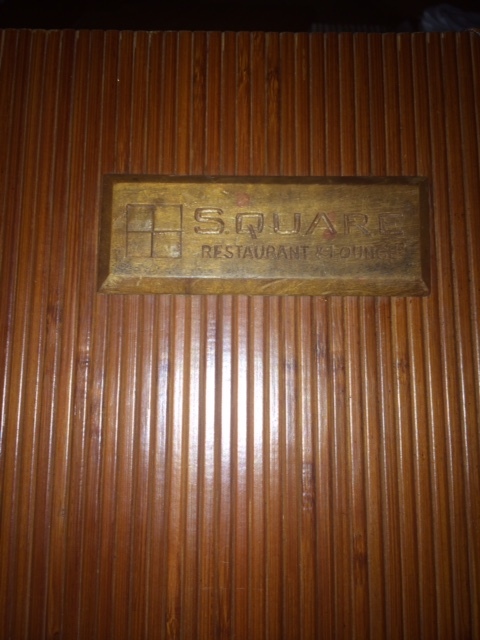 Again like with the Square we dined at Asmara twice and this restaurant served a great range of food in a tranquil setting with great service. I think in terms of service that Asmara outdid the Square because they were attentive without being over done and also asked if we wanted more drinks during the service of our meals. They were also a little more friendly and the prices were really reasonable as well. Freshly baked bread rolls were served at the beginning along with our drinks and we settled back to decide what food to have. 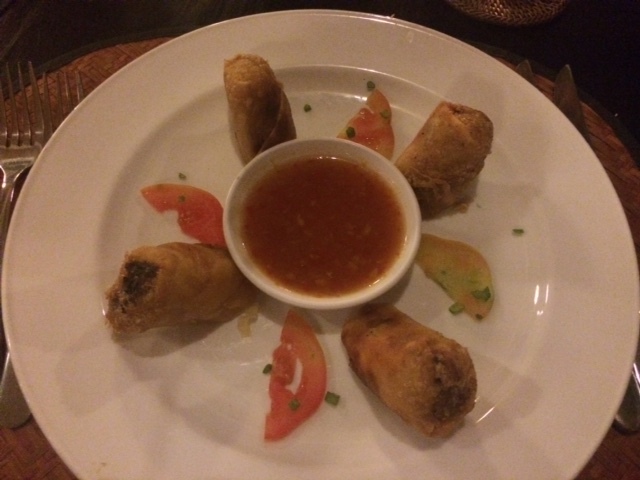 We had a vegetarian spring rolls, grilled prawns with lime butter and Spicy Sour Prawn soup for starters and each one of these was tasty as well and set the scene for the rest of the meal. Trevor and I shared the traditional Indonesian Sasak Rijstafel which consisted of Daging Pelecingan – strips of tender beef fillet in spicy chili-garlic sauce, Sate Ayam – chicken satay, Sate Pusut Ikan – minced fish and coconut satays, Ikan Rajang – tuna cooked in coconut milk with Indonesian spices, tamarind and lemongrass, Tempe Mani – chilli fried strips of soybean cake and peanuts, Urap-Urap – spicy vegetables with grated coconut and Daun Singkong – cassava leaves cooked in coconut milk. 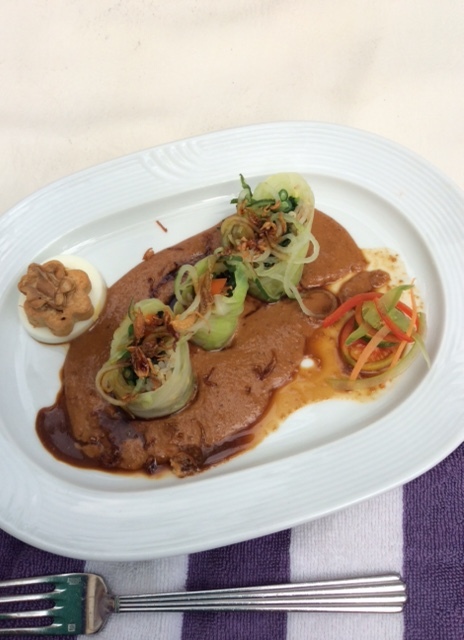 This was just sensational and a real chance to get a taste of some Indonesian dishes that we had not previously tried in our many visits to Indonesia. It was tasty, each dish complimented the other and served in small enough dishes that we could enjoy each one without getting too full. Ken had steak with blue cheese that was served with potato croquettes and seasonal vegetables and Karen had Coconut Chicken which was a chicken breast fillet coated in grated coconut and topped with baked banana; served with a mild curry sauce and sweet potato & carrot crush. 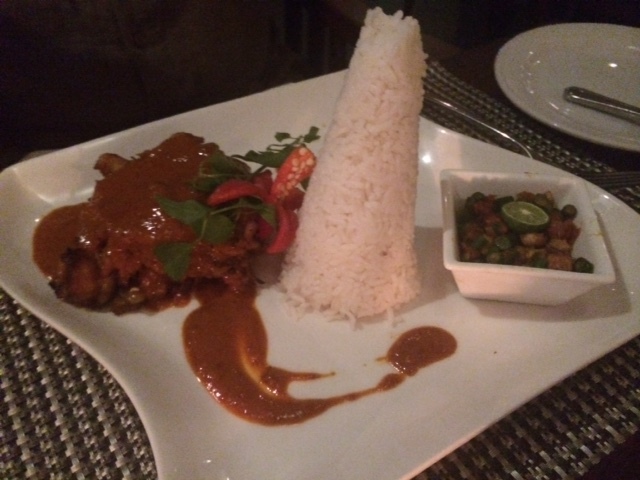 They both enjoyed these dishes and commented on the presentation and the different tastes that were combined with the coconut chicken. We were all full after 2 courses and opted not to have dessert this time. 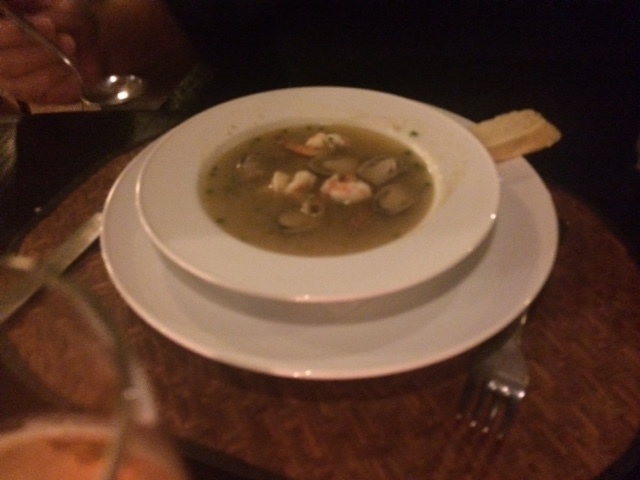 As I said before this was another great restaurant and the food was fresh, with great combinations and complex flavours that all worked together to create a memorable dining experience and prompted us to return a second time to enjoy the food and the setting. Other highlights that were situated around Senggigi that deserve a mention are the Banana Café that serves the best chicken burgers in Lombok and was really delightful. It is a small café but is a great lunch alternative during the day. Probably the other highlight was lunch at Qunci Villas ( more on Qunci when I talk about the spa treatments that we had on the trip in another post). 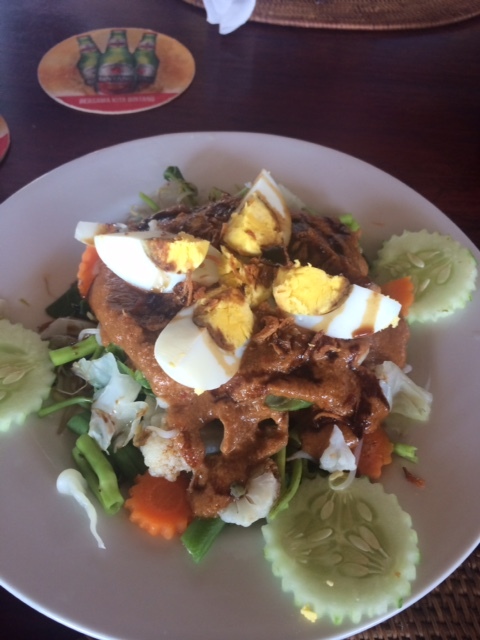 We went there for lunch and again had a variety of local Indonesian cuisine in the most perfect setting by the ocean and all enjoyed the Gado Gado, Nasi Goreng and Green Curry. 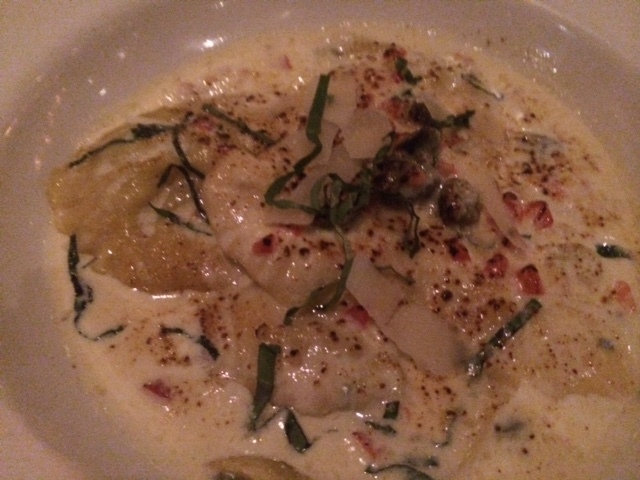 It was much more expensive than other places but the setting was perfect and the service was good. 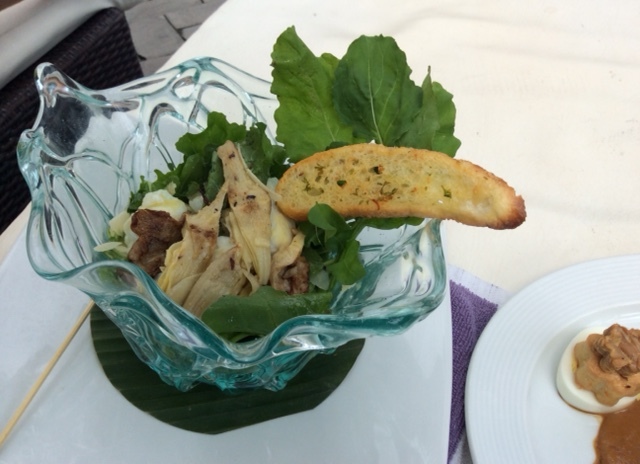 It was a lovely lunchtime option in amongst the Villas and overlooking the wonderful ocean. 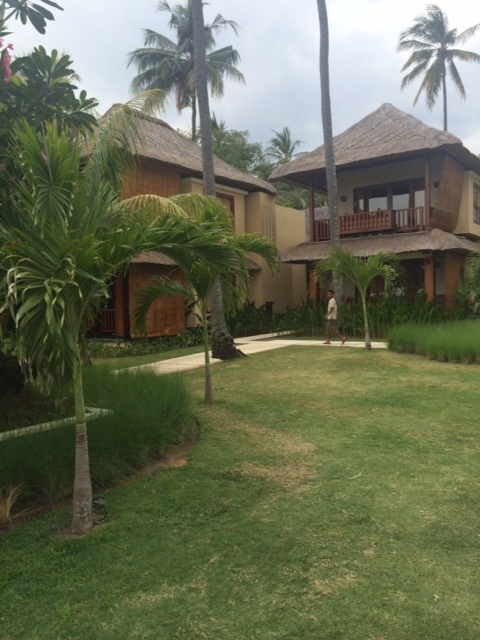 Qunci Villas – a delightful setting! 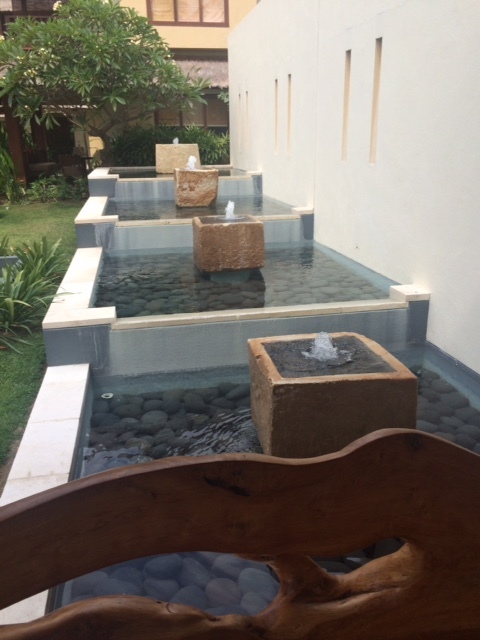 By choosing go to Qunci we got to experience the lovely grounds and the delightful pools facing the ocean. The service here was fitting of a 5 star establishment but again they were not very good with following up drink service once you were served one drink. Finally there is a little place that is about 500 metres from Qunci Villas called Paradise and it really is paradise! A local family owned and run spot it consists of tables and chairs on the beach and a menu made up of freshly caught local seafood. With a small kitchen that you can see into this is local seafood cuisine at its finest and given the location it is just perfect to sit and watch the sun go down, drink a chilled cocktail or a beer and settle back for some truly delightful simple fair at ridiculously cheap prices. 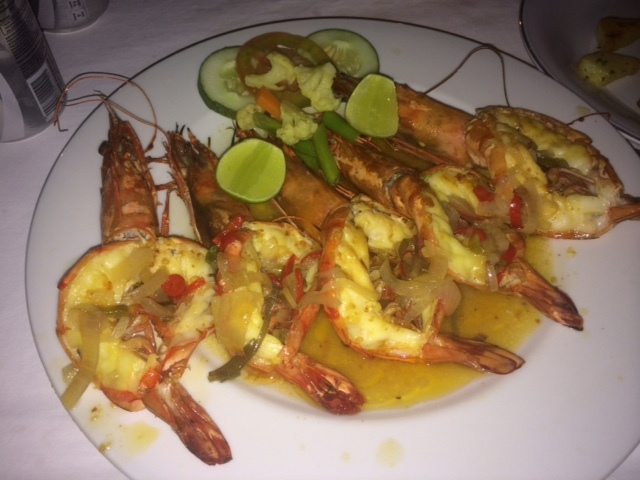 The grilled tiger prawns were simply served and tasted sensational and then the traditional banana pancake at the end of the meal served with vanilla ice cream was just perfect. Paradise is really a small taste of the simple way that things are done in Lombok and with food this tasty and this cheap it is worth seeking it out when you are there. The family are friendly, the food is cheap, the service is great and it is the most wonderful location. Sheraton food by the pool! I also need to mention the Sheraton…we chose not to eat there of an evening as there were lots of other options around but I did have the most wonderful lunch sitting by the pool that consisted of Gado Gado, chicken satays and a salad of fennel and beetroot that was simply stunning and the perfect by the pool food. Of course having breakfast each day was also a highlight as it set us all up for the rest of the day. With the fresh juice bar, where you can choose to select your own fruit and make a fresh juice to the great omelettes and freshly baked breads, donuts, rolls and croissant. Add to this the unusual option of soft serve ice cream and a chocolate fountain and there is something for everyone at the Sheraton breakfast buffet. But it really is the perfect start to a day of relaxing by the pool. 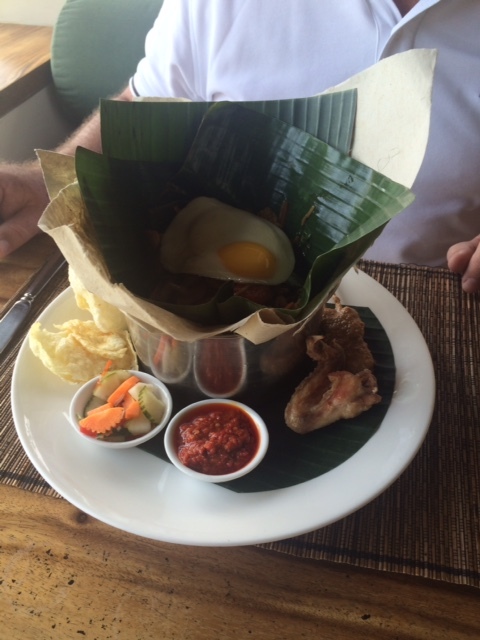 There are of course improvements and there is really no comparison to what is now being offered across in Bali but the food is always fresh, tasty and well priced. As more and more new resorts get built and the numbers of tourists increase I think they will start to lift their game in terms of service and remembering that as thirsty tourists one serve of drinks over a 2 hour meal cycle is just not enough and surely the owners should be encouraging their staff to offer more drinks to make more money! Only a small thing really, as we did not really have any unforgettable meals and we enjoyed the many and varied options that were on offer!